This page explains how the consonants, vowels and wilds are used in the Alpha Word Game System. 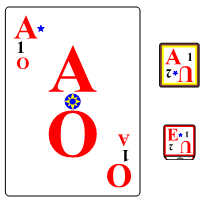 To make things a little easier to write I will explain how the consonants, vowels and wilds work with AlphaPlayingCards since they work the same for AlphaTiles and AlphaDice. The consonant cards are what you would expect in a game system that uses letters. There is only one consonant per card. The point value of each consonant is based on frequency of use of that consonant in the English language, more frequently used letters like the T score less points then less frequently used letters like the Q which scores more. The points range from one point up to ten points. The vowel cards are a little different than the consonant cards. There are two different vowels on each card and the two vowels are placed so one is at each end of the card. One of the two vowels on the card will have a mark next to it and is called the marked vowel (In the diagram the blue star is the mark). How are the vowel cards used? They can be used as a semi-wild vowel. 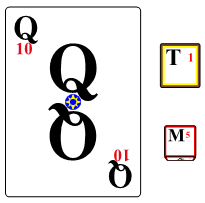 When used as a semi-wild vowel a player may choose between the two vowels simply by rotating the card 180 degrees so the vowel he wants is in the top left hand corner. They can be used as a marked vowel only. When used like this you can only play the vowel card as the vowel with the blue start next to it. This does reduce the number of vowels available in the deck and tends to make the game you are playing a little more challenging. How the vowel cards are used in a game should be explained in the rules of that game. 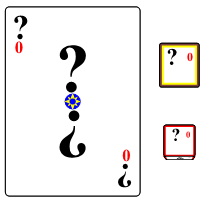 The two cards with the question mark on them are the wild cards. The wild cards can usually be played as any letter you want it to be. However, the rules for a game should specify if the card remains wild once played or if the wild cards are even used in that game. If you look at the backs of the Alpha Playing Cards you will notice that there is a 3x3 grid of spaces that the Alpha Tiles and the Alpha Dice can fit onto quite nicely. This is so you can use Alpha Playing Cards to create boards for the Alpha Tiles and/or the Alpha Dice. In the graphic below I used 6 cards to create a simple 9x6 board. With a little imagination you can create many different boards.